I have been to Rome many times. For there is always something I have not seen before to delight my eyes. On this occasion it was The Tempietto by Bramante, a tiny church in the form of a circular Classical temple, built in 1499. I found it so overpoweringly exquisite that I decided to abandon all further sightseeing for the duration of the trip. Perfect beauty must be taken in small doses, if the aesthetic appetite is not to be overwhelmed. And, just as the artistic bounty is unending, so the wealth of hospitality offered by the Eternal City seems forever capable of surprising me with yet another fine hotel. 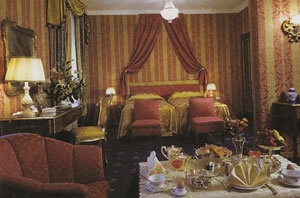 My new delight was to be found just a few steps from the expensive shops and the majestic sweep of the Via Veneto. It was the Hotel Bernini Bristol. This handsome pile inhabits the piazza Barberini. 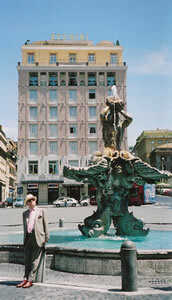 My picture shows a smart young tourist in a panama hat (your correspondent) leaning on a bollard next to the piazza’s chief adornment, the Triton Fountain. As is the way in Rome, this water feature is not the work of some worthy municipal architect in the 19th century: it is masterpiece by the great Bernini (he of the colonnade around St Peter’s Square and the baldachino over the high altar within the basilica) and was erected in 1642. You will observe that it comprises four dolphins, supporting an open scallop shell, in which sits a triton blowing into a conch. You will further observe that behind it rises the simple but elegant façade of the hotel. When it was opened in 1874, the Bernini Bristol (then called simply The Bristol) could boast one of the wonders of the age: an hydraulic lift, supplied by an underground spring. This, and its reputation for comfort and exclusivity, soon ensured that its guest list began to fill up with the names of the great and the good. They would eventually include Don Pedro II, ruler of Brazil, and Aristotle Onassis. I suspect that the Emperor and the shipping magnate liked – as I did – the hotel’s location and its atmosphere of luxurious calm. The latter is most welcome after the noise and rush of the Roman traffic (still a snarling beast, despite the welcome efforts of the authorities to play lion-tamer). To walk through the doors of the Bernini Bristol is to enter a world of fine fabrics, period furniture and 18th century tapestries. All these are used to good effect in the public areas on the ground floor. It was a real pleasure to be able to relax in these civilized surroundings. 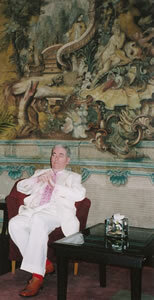 I hope that the picture I reproduce for you conveys my sense of repose as well as it does the quality of the tapestry. Room 220 was on the second floor, on the quiet (i.e. left) side of the building. Remarkably, it had its own outside terrace with a table and chairs. I say ‘remarkably’, because from the front of the hotel it did not appear that such an arrangement was possible. This was a ‘deluxe double’ and therefore 621 euros a night, bed and breakfast for two. 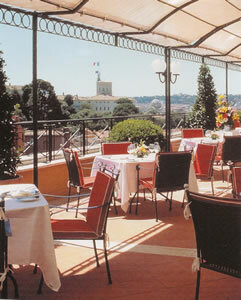 Rome is an expensive city, so I judged such a rate to be good value. Its style was of the traditional sort. Dark pink and gold were the prevailing colours. Silk brocade covered the walls. The pieces of furniture, like the writing table, were in the 18th century style, with cross-banded woods and ormolu mounts. Around the ceiling was a cornice of the egg and dart design. There was one easy chair. Efficient air conditioning kept me cool and two wall lights and a table lamp provided effective illumination. I appreciated the large coat hooks in the hallway (for I like to stow my hat out of the way) and I liked the mirrored doors to the fitted wardrobes in the bedroom (for it is important to see one’s full length, if one is to maintain sartorial propriety). The bathroom of grey marble, although small, was also to my taste. It possessed one wash basin, a bidet and a tub of proper length. 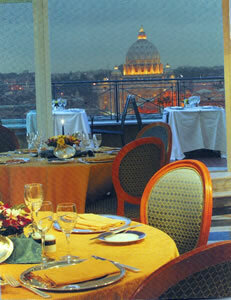 Although I did not dine in the hotel, I did go up to the top floor to look at the Ristorante L’Olimpo (see pictures). I had heard that the views were spectacular, and they were. 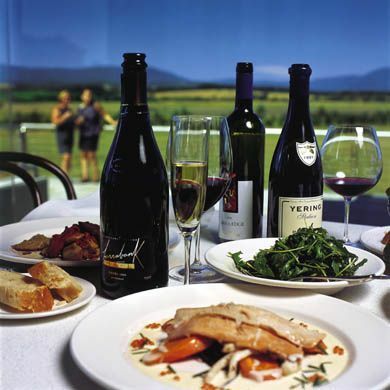 When I re-visit the Bernini Bristol, I must be sure to try the food from Chef Michele Simioli’s kitchen. If it lives up to the panorama, it will be remarkable. I did, of course, have breakfast. This was served in a large, bright room on the first floor. Its windows overlooked the piazza, so the Triton Fountain was visible from some of the tables. But the style was not only outside. Crystal chandeliers and potted palms graced this attractive chamber, and encouraged me to linger. I do not, of course, need much encouragement to linger over the breaking of my fast. A rushed breakfast means a ruined day, so I took my time over the bounty from the buffet. Bacon, fresh pineapple, Corn Flakes, fruit salad and croissants – all of good quality – were consumed at a leisurely pace, along with decent cappuccinos brought by the particularly friendly waitresses. I was grateful to those waitresses. But they were not the only members of staff to offer me courtesy and help. The front desk, too, deserves an honourable mention. The standard of service reflected well on the General Manager, Stefano Chiesa. If, like me, you will never tire of Rome and its endless marvels, you should consider the Bernini Bristol for your next trip. 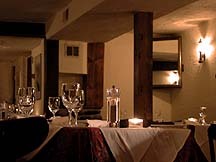 It offers comfort, elegance, a fine location and excellent value. I have been to Rome many times. I intend to go many more. 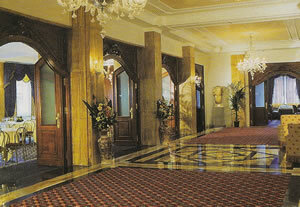 I hope I shall be seeing the Hotel Bernini Bristol again. Piazza Barbarini 23, 00187 Rome, Italy.